It'll have a 2003 date on it. Is Dusty getting one also. It's dumb! Invite him to throw out first pitch, give him and his fam a suite with all the food and drinks they want, let him sing "Take me out to the ballgame"...all good ideas to try to make up for some of the grief he's had to endure, but a ring? Come on, I'd sell that thing so fast, how embarrassing to be awarded something you had no part in earning. I remember the year after Edgerrin James left the Colts they won the Super Bowl and they sent him a ring "here look what we won as soon as you left!" ridiculous. Players, managers, coaches, executives who help run the team, yes they deserve rings, NO ONE else. He endured stalking and death threats, and had to essentially withdraw from society. If you are going to go over the top, you do it in this sort of instance. I don't think he got a ring like the ones the players got. Every cubs employee got a ring. They had to sign a contract saying the only entity it could be sold to was the Cubs. Agreed. When I first read this story, I thought it was beyond bizarre. I mean I feel terrible for the man and all the hate he got, but if anything, he may have cost them a World Series. He certainly didn't do anything to earn one. Anyone from Chicago? I'd love to hear their perspective. Agreed. When I first read this story, I thought it was beyond bizarre. I mean I feel terrible for the man and all the hate he got, but if anything, he may have cost them a World Series. Oh jeez hasn't it been proven he didn't reach over the wall and most agree Alou wouldn't have gotten the ball anyway? 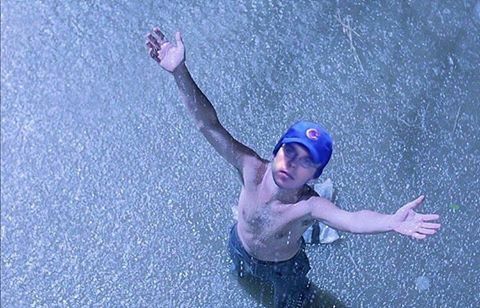 They had another whole game they could've won, Bartman didn't cost them anything. but if anything, he may have cost them a World Series. Tbh I hadn't heard any of that. I remember the incident but didn't follow much of the controversy afterwards. He definitely didn’t cost them that game, much less the NLCS, much less the World Series. He didn’t do anything wrong, was a lifelong fan who was treated like crap by the Cubs and the city. He endured death threats and went into hiding. And this a small gesture the Cubs did to make things right. He deserves more than a ring, but this is the olive branch he decided to accept. Very small consolation for what he went through. I polled my 4 cub fans friends (all diehard). Small sample size, but every one of them said they were happy to hear the cubs do this. Although I do not consider myself worthy of such an honor, I am deeply moved and sincerely grateful to receive an official Chicago Cubs 2016 World Series Championship ring. I am fully aware of the historical significance and appreciate the symbolism the ring represents on multiple levels. My family and I will cherish it for generations. Most meaningful is the genuine outreach from the Ricketts family, on behalf of the Cubs organization and fans, signifying to me that I am welcomed back into the Cubs family and have their support going forward. I am relieved and hopeful that the saga of the 2003 foul ball incident surrounding my family and me is finally over. I humbly receive the ring not only as a symbol of one of the most historic achievements in sports, but as an important reminder for how we should treat each other in today's society. My hope is that we all can learn from my experience to view sports as entertainment and prevent harsh scapegoating, and to challenge the media and opportunistic profiteers to conduct business ethically by respecting personal privacy rights and not exploit any individual to advance their own self-interest or economic gain. Words alone cannot express my heartfelt thanks to the Ricketts family, Crane Kenney, Theo Epstein, and the entire Cubs organization for this extraordinary gift, and for providing the City of Chicago and Cubs fans everywhere an unforgettable World Championship in 2016. I am happy to be reunited with the Cubs family and positively moving forward with my life. Yeah, that's where I was. I thought he was a jerkoff that cost his team, but it turns out he didn't interfere with the ball. Alou would've caught it but he's not the only one reaching out for the foul ball. His mistake in my opinion was that he sat there like a freaking nag after people started giving him crap about it and didn't stand his ground. It was all downhill from then on.